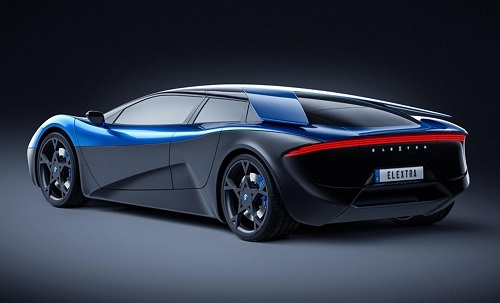 ELEXTRA brings together the highest-level of engineering and craftsmanship available, creating a unique electric supercar with 4 seats, 4 doors, 4-wheel drive, and capable of executing the 0-100 km/h sprint in less than 2.3 seconds. Designed in Switzerland, built in Germany and based upon the best electric vehicle platform in the world, ELEXTRA redefines the supercar. Built around a stiff and extremely strong carbon fibre tub, ELEXTRA benefits from a lightweight, advanced and superbly designed carbon fibre body shell. The achieved weight gain is hence nearly 25% less than conventional aluminium constructions. ELEXTRA features a dual motor electric drivetrain, which delivers a substantial improvement over conventional all-wheel drive systems. The torque is electronically and independently distributed to the front and rear wheels. The result is unparalleled traction in all conditions. The 680 hp* dual motors catapult ELEXTRA from standstill to 100 km/h in less than 2.3 seconds, which simply makes it the quickest street legal car in the world. The top speed is limited to 250 km/h. ​ELEXTRA is extremely quick, but also extremely efficient: the range at 100 km/h reaches 600 km.